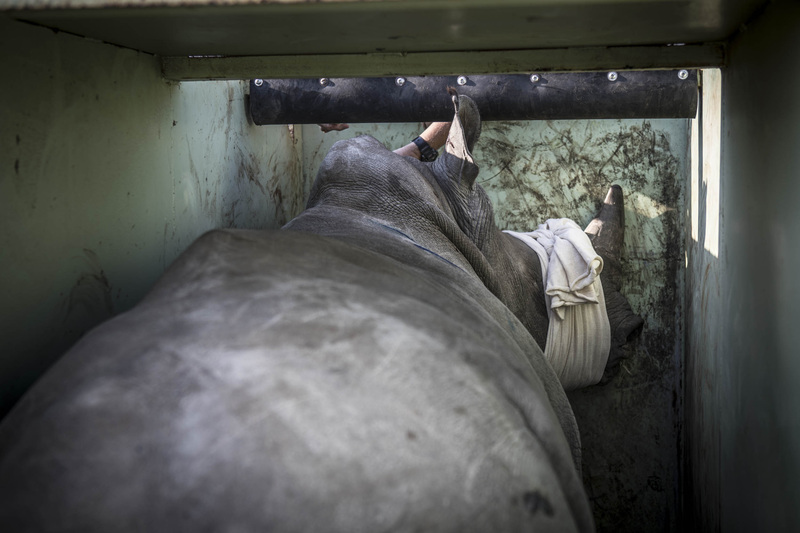 A rhino in a transport crate before it is craned onto a truck for transportation from South Africa to Botswana. ---- The rhino population in Africa has fallen by more than 95 percent since 1900, to just 21,000 southern white rhinos and 5,000 black rhinos; 80 percent of those animals are in South Africaâs game reserves and on ranches. In a response to the dire situation that is facing rhinos in Africa, with rhino poaching at an all-time high, concerned conservationists teamed together to create Rhinos Without Borders (@rhinowb). RWB plans to relocate 100 white rhinos from South Africa to safe havens in Botswana, where poaching is almost non-existent.